Hand-made truffles, caramels, barks and dipped fruits from a former farm-to-table chef. Selection changes from day to day, but highlights include truffles made with locally-sourced spirits, crunchy nut praline truffles, and unusual ingredients like quince. They also offer workshops. High quality chocolate with locally sourced (as much as possible) ingredients handmade into little gems. Also barks, bars, and special seasonal items. Stand-outs include Fennel Pollen, Passion Fruit, Lavender, and Sunflower Seed Praline. Online and at their store, 6525 Washington St., Yountville (Napa Valley). 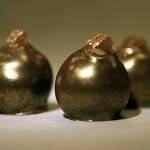 Hand-made, hand-decorated bonbons, truffles and liquid caramels. Check their website for events and locations where you can buy them. You can’t miss with any of the flavors, but if available, try the Fig & Walnut and Peanut Butter Cups. Don’t pass up their Root Beer chocolates. In-store, online and at Bi-Rite Market, SF; Fog City News, SF and other SFBA locations. We like everything we’ve ever tasted by Recchiuti. From truffles to dipped fruits to baked goods — whatever they are selling, we’re buying. One Ferry Building, Shop #30, SF; theLab, 801 22nd St (at Tennessee St.), SF; online and at many specialty food stores in CA and across the US. 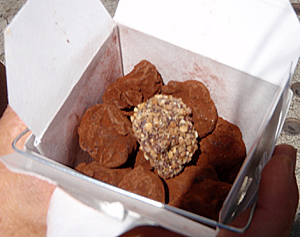 Classic hand-shaped truffles in a variety of flavors. Beautiful and delicious chocolates, including truffles, caramels and novelty items, from a husband-and-wife team that adds little tweaks and extra somethings to make each flavor more special. Packaging is also often delightful. Made with fresh ginger so it has a real ginger bite along with some warmth from the chili, but balanced nicely with the sweetness of the chocolate and caramel. Roasted peanuts on top complete the Thai influence. CocoTutti. Truffle of dark chocolate ganache with Earl Grey tea, creme fraiche & orange, topped with a bit of crystalized ginger by Vice Chocolates. Orange & ginger stand out but don’t overpower the dark chocolate. Not a drink, but a truffle by Barlovento Chocolates. Hot! Hot! Hot! Another hot truffle, Vixen from Vice Chocolates, combines dark chocolate ganache with passion fruit and chili pepper for a real chocolate experience that goes from chocolate to fruity to hot. 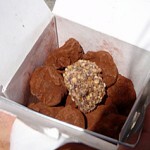 NOTE: 4-cup chocolatiers and noteworthy chocolates are marked with a in articles on this site.